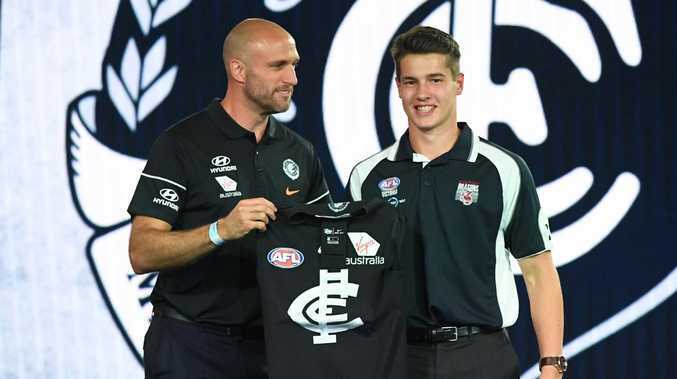 Whether he plays one AFL game or 200, Liam Stocker's career will be linked forever to Carlton's audacious draft-day trade. 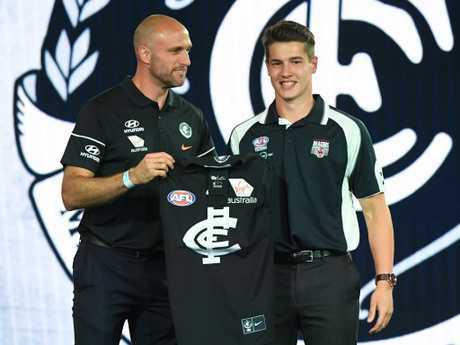 In a move that rocked the first round and would be examined closely over the next 12 months, Blues list boss Stephen Silvagni swapped 2019 first-round picks with Adelaide to claim Stocker at pick No.19. How the two clubs fare next season will have a large say in who has 'won' the trade - the Crows will get the No.1 pick if the Blues finish last - but so too will what sort of player Stocker turns into. In a surprising revelation, AFL.com.au reporter Callum Twomey - who said the trade was the single biggest shock of the two-day draft period - revealed it almost didn't happen. "Had Xavier Duursma, who was taken the pick before Adelaide's pick by Port, had he got through, then Adelaide would've taken him and said no to that deal with the Blues and I guess there's a fair chance that deal would've fallen through," he said on SEN Thursday. The Blues reportedly tried trading with the Giants but were given the cold shoulder. "The Blues had actually put the same offer on the table to the Giants earlier in the week, but they knocked that one back," he said. "That would've been for pick 22 where they picked up Xavier O'Halloran. "The Giants were intent on keeping that pick. They wanted a really good hand at this year's draft and weren't too worried about next year's (draft)." The strong-bodied Sandringham Dragons midfielder isn't fazed by the association and doesn't intend to let it be a factor as he embarks on his AFL journey. 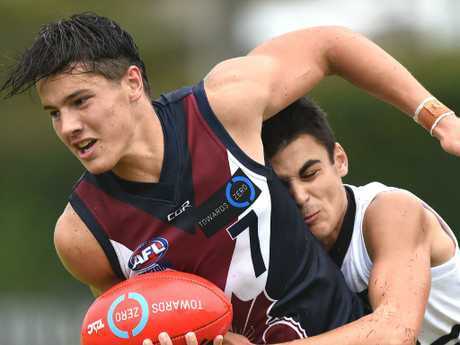 Liam Stocker was caught up in a shock draft storm. "I'm sure there are plenty of people on social media giving their opinion but it doesn't bother me too much," Stocker said. "However my career goes, I won't leave a stone unturned ... (the trade) won't worry me. "What Bolts (Brendon Bolton) and SOS (Stephen Silvagni) said afterwards really instilled some confidence in me. "The main thing I was looking for, in terms of the best fit at a club, was belief and they certainly have that for me. "I can't help but try to repay that faith now." Stocker is aiming to play in round one against Richmond but knows he will need to improve his endurance - a flaw in his game famously driven home to him by the Tigers' recruiters in a combine interview. The Sandringham Dragons shows lots of promise. Strangely enough, Fremantle might have given Carlton's midfield stocks a boost in that regard. Stocker sought out the help of former Haileybury schoolmate Andrew Brayshaw to help him improve his fitness, while the young Docker recovered from the broken jaw inflicted by West Coast's Andrew Gaff. "He was good enough to show me what he'd been doing with Freo during his rehab from his (broken) jaw," Stocker said. "I just picked up on that and thought that, if I could do even 90 per cent of it, I'd be better for it. "When he was back here (in Melbourne) when I could I would do stuff with him ... but I just tried to make sure I did his program to make sure I (improved)."